For the video game publisher, see Visual Arts (company). The visual arts are art forms such as ceramics, drawing, painting, sculpture, printmaking, design, crafts, photography, video, filmmaking, and architecture. Many artistic disciplines (performing arts, conceptual art, textile arts) involve aspects of the visual arts as well as arts of other types. Also included within the visual arts are the applied arts such as industrial design, graphic design, fashion design, interior design and decorative art. Current usage of the term "visual arts" includes fine art as well as the applied, decorative arts and crafts, but this was not always the case. Before the Arts and Crafts Movement in Britain and elsewhere at the turn of the 20th century, the term 'artist' was often restricted to a person working in the fine arts (such as painting, sculpture, or printmaking) and not the handicraft, craft, or applied art media. The distinction was emphasized by artists of the Arts and Crafts Movement, who valued vernacular art forms as much as high forms. Art schools made a distinction between the fine arts and the crafts, maintaining that a craftsperson could not be considered a practitioner of the arts. The increasing tendency to privilege painting, and to a lesser degree sculpture, above other arts has been a feature of Western art as well as East Asian art. In both regions painting has been seen as relying to the highest degree on the imagination of the artist, and the furthest removed from manual labour – in Chinese painting the most highly valued styles were those of "scholar-painting", at least in theory practiced by gentleman amateurs. The Western hierarchy of genres reflected similar attitudes. Training in the visual arts has generally been through variations of the apprentice and workshop systems. In Europe the Renaissance movement to increase the prestige of the artist led to the academy system for training artists, and today most of the people who are pursuing a career in arts train in art schools at tertiary levels. Visual arts have now become an elective subject in most education systems. Drawing is a means of making an image, using any of a wide variety of tools and techniques. It generally involves making marks on a surface by applying pressure from a tool, or moving a tool across a surface using dry media such as graphite pencils, pen and ink, inked brushes, wax color pencils, crayons, charcoals, pastels, and markers. Digital tools that simulate the effects of these are also used. The main techniques used in drawing are: line drawing, hatching, crosshatching, random hatching, scribbling, stippling, and blending. An artist who excels in drawing is referred to as a draftsman or draughtsman. Drawing goes back at least 16,000 years to Paleolithic cave representations of animals such as those at Lascaux in France and Altamira in Spain. In ancient Egypt, ink drawings on papyrus, often depicting people, were used as models for painting or sculpture. Drawings on Greek vases, initially geometric, later developed to the human form with black-figure pottery during the 7th century BC. With paper becoming common in Europe by the 15th century, drawing was adopted by masters such as Sandro Botticelli, Raphael, Michelangelo, and Leonardo da Vinci who sometimes treated drawing as an art in its own right rather than a preparatory stage for painting or sculpture. Painting taken literally is the practice of applying pigment suspended in a carrier (or medium) and a binding agent (a glue) to a surface (support) such as paper, canvas or a wall. However, when used in an artistic sense it means the use of this activity in combination with drawing, composition, or other aesthetic considerations in order to manifest the expressive and conceptual intention of the practitioner. Painting is also used to express spiritual motifs and ideas; sites of this kind of painting range from artwork depicting mythological figures on pottery to The Sistine Chapel to the human body itself. Like drawing, painting has its documented origins in caves and on rock faces. The finest examples, believed by some to be 32,000 years old, are in the Chauvet and Lascaux caves in southern France. In shades of red, brown, yellow and black, the paintings on the walls and ceilings are of bison, cattle, horses and deer. 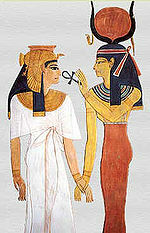 Paintings of human figures can be found in the tombs of ancient Egypt. In the great temple of Ramses II, Nefertari, his queen, is depicted being led by Isis. The Greeks contributed to painting but much of their work has been lost. One of the best remaining representations are the Hellenistic Fayum mummy portraits. 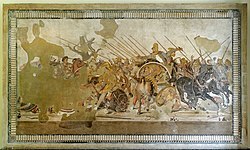 Another example is mosaic of the Battle of Issus at Pompeii, which was probably based on a Greek painting. Greek and Roman art contributed to Byzantine art in the 4th century BC, which initiated a tradition in icon painting. Apart from the illuminated manuscripts produced by monks during the Middle Ages, the next significant contribution to European art was from Italy's renaissance painters. From Giotto in the 13th century to Leonardo da Vinci and Raphael at the beginning of the 16th century, this was the richest period in Italian art as the chiaroscuro techniques were used to create the illusion of 3-D space. Painters in northern Europe too were influenced by the Italian school. Jan van Eyck from Belgium, Pieter Bruegel the Elder from the Netherlands and Hans Holbein the Younger from Germany are among the most successful painters of the times. They used the glazing technique with oils to achieve depth and luminosity. The 17th century witnessed the emergence of the great Dutch masters such as the versatile Rembrandt who was especially remembered for his portraits and Bible scenes, and Vermeer who specialized in interior scenes of Dutch life. The Baroque started after the Renaissance, from the late 16th century to the late 17th century. Main artists of the Baroque included Caravaggio, who made heavy use of tenebrism. Peter Paul Rubens was a flemish painter who studied in Italy, worked for local churches in Antwerp and also painted a series for Marie de' Medici. Annibale Carracci took influences from the Sistine Chapel and created the genre of illusionistic ceiling painting. Much of the development that happened in the Baroque was because of the Protestant Reformation and the resulting Counter Reformation. Much of what defines the Baroque is dramatic lighting and overall visuals. Impressionism began in France in the 19th century with a loose association of artists including Claude Monet, Pierre-Auguste Renoir and Paul Cézanne who brought a new freely brushed style to painting, often choosing to paint realistic scenes of modern life outside rather than in the studio. This was achieved through a new expression of aesthetic features demonstrated by brush strokes and the impression of reality. They achieved intense colour vibration by using pure, unmixed colours and short brush strokes. The movement influenced art as a dynamic, moving through time and adjusting to new found techniques and perception of art. Attention to detail became less of a priority in achieving, whilst exploring a biased view of landscapes and nature to the artists eye. Towards the end of the 19th century, several young painters took impressionism a stage further, using geometric forms and unnatural colour to depict emotions while striving for deeper symbolism. Of particular note are Paul Gauguin, who was strongly influenced by Asian, African and Japanese art, Vincent van Gogh, a Dutchman who moved to France where he drew on the strong sunlight of the south, and Toulouse-Lautrec, remembered for his vivid paintings of night life in the Paris district of Montmartre. Edvard Munch, a Norwegian artist, developed his symbolistic approach at the end of the 19th century, inspired by the French impressionist Manet. 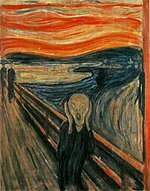 The Scream (1893), his most famous work, is widely interpreted as representing the universal anxiety of modern man. Partly as a result of Munch's influence, the German expressionist movement originated in Germany at the beginning of the 20th century as artists such as Ernst Kirschner and Erich Heckel began to distort reality for an emotional effect. In parallel, the style known as cubism developed in France as artists focused on the volume and space of sharp structures within a composition. Pablo Picasso and Georges Braque were the leading proponents of the movement. Objects are broken up, analyzed, and re-assembled in an abstracted form. By the 1920s, the style had developed into surrealism with Dali and Magritte. Printmaking is creating, for artistic purposes, an image on a matrix that is then transferred to a two-dimensional (flat) surface by means of ink (or another form of pigmentation). Except in the case of a monotype, the same matrix can be used to produce many examples of the print. Historically, the major techniques (also called media) involved are woodcut, line engraving, etching, lithography, and screenprinting (serigraphy, silkscreening) but there are many others, including modern digital techniques. Normally, the print is printed on paper, but other mediums range from cloth and vellum to more modern materials. Major printmaking traditions include that of Japan (ukiyo-e). Prints in the Western tradition produced before about 1830 are known as old master prints. In Europe, from around 1400 AD woodcut, was used for master prints on paper by using printing techniques developed in the Byzantine and Islamic worlds. Michael Wolgemut improved German woodcut from about 1475, and Erhard Reuwich, a Dutchman, was the first to use cross-hatching. At the end of the century Albrecht Dürer brought the Western woodcut to a stage that has never been surpassed, increasing the status of the single-leaf woodcut. In China, the art of printmaking developed some 1,100 years ago as illustrations alongside text cut in woodblocks for printing on paper. Initially images were mainly religious but in the Song Dynasty, artists began to cut landscapes. 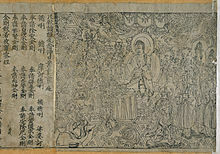 During the Ming (1368–1644) and Qing (1616–1911) dynasties, the technique was perfected for both religious and artistic engravings. Woodblock printing in Japan (Japanese: 木版画, moku hanga) is a technique best known for its use in the ukiyo-e artistic genre; however, it was also used very widely for printing books in the same period. Woodblock printing had been used in China for centuries to print books, long before the advent of movable type, but was only widely adopted in Japan surprisingly late, during the Edo period (1603–1867). Although similar to woodcut in western printmaking in some regards, moku hanga differs greatly in that water-based inks are used (as opposed to western woodcut, which uses oil-based inks), allowing for a wide range of vivid color, glazes and color transparency. Photography is the process of making pictures by means of the action of light. The light patterns reflected or emitted from objects are recorded onto a sensitive medium or storage chip through a timed exposure. The process is done through mechanical shutters or electronically timed exposure of photons into chemical processing or digitizing devices known as cameras. Architecture is the process and the product of planning, designing, and constructing buildings or any other structures. Architectural works, in the material form of buildings, are often perceived as cultural symbols and as works of art. Historical civilizations are often identified with their surviving architectural achievements. Visual artists are no longer limited to traditional art media. Computers have been used as an ever more common tool in the visual arts since the 1960s. Uses include the capturing or creating of images and forms, the editing of those images and forms (including exploring multiple compositions) and the final rendering or printing (including 3D printing). Computer art is any in which computers played a role in production or display. Such art can be an image, sound, animation, video, CD-ROM, DVD, video game, website, algorithm, performance or gallery installation. Many traditional disciplines are now integrating digital technologies and, as a result, the lines between traditional works of art and new media works created using computers have been blurred. For instance, an artist may combine traditional painting with algorithmic art and other digital techniques. As a result, defining computer art by its end product can be difficult. Nevertheless, this type of art is beginning to appear in art museum exhibits, though it has yet to prove its legitimacy as a form unto itself and this technology is widely seen in contemporary art more as a tool rather than a form as with painting. Computer usage has blurred the distinctions between illustrators, photographers, photo editors, 3-D modelers, and handicraft artists. Sophisticated rendering and editing software has led to multi-skilled image developers. Photographers may become digital artists. Illustrators may become animators. Handicraft may be computer-aided or use computer-generated imagery as a template. Computer clip art usage has also made the clear distinction between visual arts and page layout less obvious due to the easy access and editing of clip art in the process of paginating a document, especially to the unskilled observer. Plastic arts is a term for art forms that involve physical manipulation of a plastic medium by moulding or modeling such as sculpture or ceramics. The term has also been applied to all the visual (non-literary, non-musical) arts. Materials that can be carved or shaped, such as stone or wood, concrete or steel, have also been included in the narrower definition, since, with appropriate tools, such materials are also capable of modulation. This use of the term "plastic" in the arts should not be confused with Piet Mondrian's use, nor with the movement he termed, in French and English, "Neoplasticism." Sculpture is three-dimensional artwork created by shaping or combining hard or plastic material, sound, or text and or light, commonly stone (either rock or marble), clay, metal, glass, or wood. Some sculptures are created directly by finding or carving; others are assembled, built together and fired, welded, molded, or cast. Sculptures are often painted. A person who creates sculptures is called a sculptor. Because sculpture involves the use of materials that can be moulded or modulated, it is considered one of the plastic arts. The majority of public art is sculpture. Many sculptures together in a garden setting may be referred to as a sculpture garden. Sculptors do not always make sculptures by hand. With increasing technology in the 20th century and the popularity of conceptual art over technical mastery, more sculptors turned to art fabricators to produce their artworks. With fabrication, the artist creates a design and pays a fabricator to produce it. This allows sculptors to create larger and more complex sculptures out of material like cement, metal and plastic, that they would not be able to create by hand. Sculptures can also be made with 3-d printing technology. In the United States, the law protecting the copyright over a piece of visual art gives a more restrictive definition of "visual art". ^ An About.com article by art expert, Shelley Esaak: What Is Visual Art? ^ Different Forms of Art – Applied Art. Buzzle.com. Retrieved 11 Dec 2010. ^ "Centre for Arts and Design in Toronto, Canada". Georgebrown.ca. 15 February 2011. Archived from the original on 28 October 2011. Retrieved 30 October 2011. ^ Art History: Arts and Crafts Movement: (1861–1900). From World Wide Arts Resources Archived 13 October 2009 at the Portuguese Web Archive. Retrieved 24 October 2009. ^ History of Drawing. From Dibujos para Pintar. Retrieved 23 October 2009. ^ "Drawing". History.com. 2006. Archived from the original on 14 March 2009. Retrieved 23 October 2009. ^ History of Painting. From History World. Retrieved 23 October 2009. ^ History of Renaissance Painting. From ART 340 Painting. Retrieved 24 October 2009. ^ Mutsaers, Inge. "Ashgate Joins Routledge - Routledge" (PDF). Ashgate.com. Retrieved 15 October 2018. ^ "Impressionist art & paintings, What is Impressionist art? Introduction to Impressionism". Retrieved 24 September 2018. ^ Post-Impressionism. Metropolitan Museum of Art. Retrieved 25 October 2009. ^ Modern Art Movements. Irish Art Encyclopedia. Retrieved 25 October 2009. ^ The Printed Image in the West: History and Techniques. The Metropolitan Museum of Art. Retrieved 25 October 2009. ^ Engraving in Chinese Art. From Engraving Review Archived 29 July 2012 at Archive.today. Retrieved 23 October 2009. ^ The History of Engraving in China. From ChinaVista. Retrieved 25 October 2009. ^ "Merriam-Webster Online (entry for "plastic arts")". Merriam-webster.com. Retrieved 30 October 2011. ^ "Copyright Law of the United States of America – Chapter 1 (101. Definitions)". Copyright.gov. Retrieved 30 October 2011. Wikimedia Commons has media related to Visual arts. Wikimedia Commons has media related to Plastic arts. Wikivoyage has a travel guide for Visual arts. Wikivoyage has a travel guide for Works of art. ArtLex – online dictionary of visual art terms. Calendar for Artists – calendar listing of visual art festivals. This page was last edited on 20 April 2019, at 12:19 (UTC).